Working with material outside the normal video color space can cause confusion both on set and in the edit suite with colors that are not properly represented for client review and approval. LUT-box ensures that every monitor is showing the correct color space and look for any source signal while still allowing the original footage to remain in an alternate color space to take advantage of additional dynamic range. 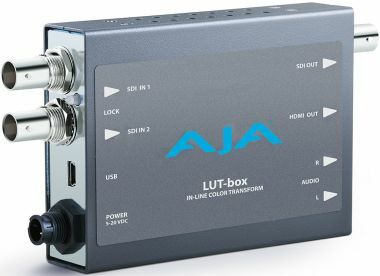 LUT-box accepts 3G and Dual-Link input in a wide range of signal formats. Simultaneous SDI and HDMI outputs allow multiple monitors to view the corrected color signal. Up to 16-channels of embedded SDI audio are supported on input and can be passed to 8-channel of embedded HDMI audio on the output. Two channels of analog audio output allow direct external monitoring without the need to disembed the audio separately.